Dril-Quip’s OilPatch Technologies NF2000 production riser connector used in TLP project. OilPatch Technologies NF2000 production riser string is being prepared for installation on a tension leg platform (TLP) development project located approximately 75 kilometers offshore Republic of Congo. This development consists of up to 34 wells tied back to the new TLP. The NF2000 is a premium thread and coupled riser connector that features high performance fatigue characteristics that make it suitable for use in top tension riser applications. 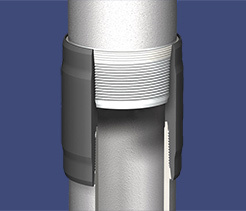 The connector has a metal-to-metal gas tight primary seal, a metal-to-metal external seal isolating the connection’s threads, and a patented thread form to enhance the connection’s fatigue life. Visit product page for more information.